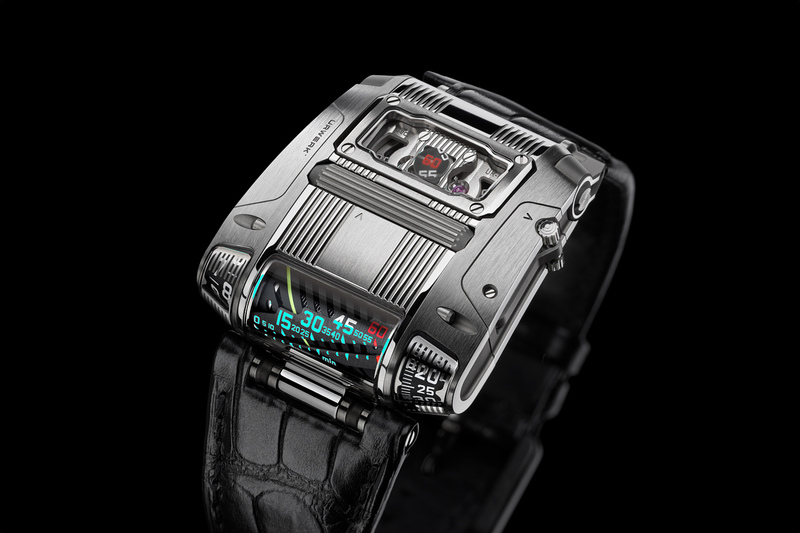 Urwerk unveiled the UR-111C with a unique roller integrated into the top of the case which allows you to wind the watch by rolling your thumb or finger on the long fluted cylinder. 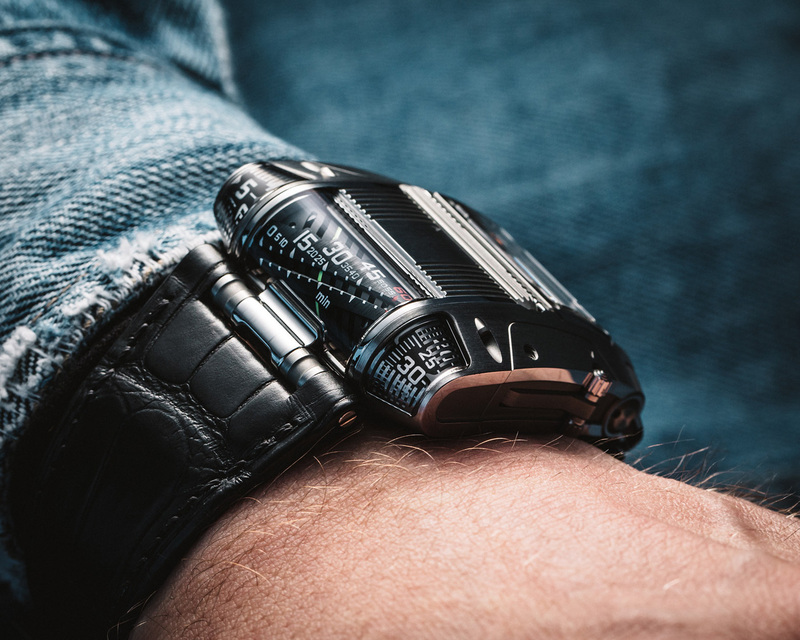 The watch which comes in a polished steel or gunmetal case that measures 46 mm x 42 mm x 15 mm, features jumping hours, retrograde linear minutes, digital minutes, and digital seconds. Instead of pulling out a crown to set the time you swing out a lever from the side of the case and turn the roller in either direction. The hours and two versions of the minutes are displayed within glass sapphire covers along the side of the case so that you can see them at a glance without turning your wrist or letting go of the steering wheel. The jumping digital hours and progressive minutes are displayed on rotating truncated cones left and right of the retrograde linear indication of the minutes. Digital seconds are displayed on the top of the case. 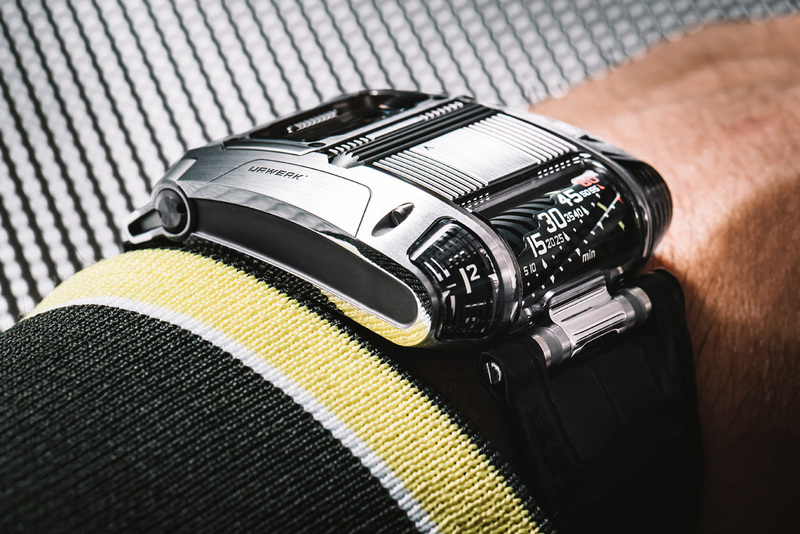 According to Urwerk, “The UR-111C’s digital seconds are mounted alternately on two tiny wheels: 10, 20, 30, 40, 50 and 60 on one wheel, and 5, 15, 25, 35, 45 and 55 on the other. Each openwork seconds wheel weighs 0.018 grams (0.025g with numerals) — miniature lacework in metal thanks to the LIGA process. The seconds numerals look strangely close as they pass across a circular window in sinuous progression. They appear alternately, transported into visual range by a dense cluster of precisely aligned optical fibers, known as an image conduit, positioned a tenth of a millimeter above the numerals. 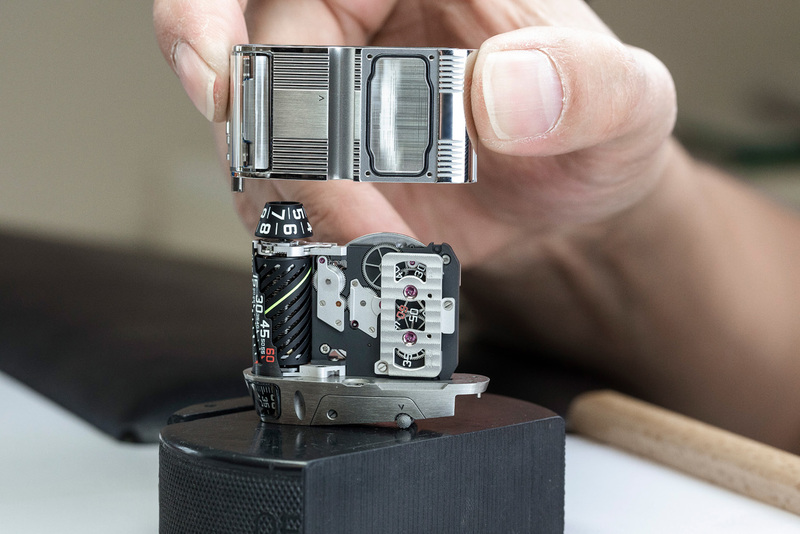 This is a world Première in the watchmaking area!” Finishing on the case and movement includes circular graining, shot-blasted, sanding, côtes de Genève, and polishing. The movement beats at 4Hz and has a 48-hour power reserve. Water-resistance is 30 meters. Retail is approximately $130,000 and there will be 25 in polished steel and 25 in gunmetal. At the end we recommend you to check TOP 10 most expensive wrist watches in the worlds and 25 luxury watch brands for men.